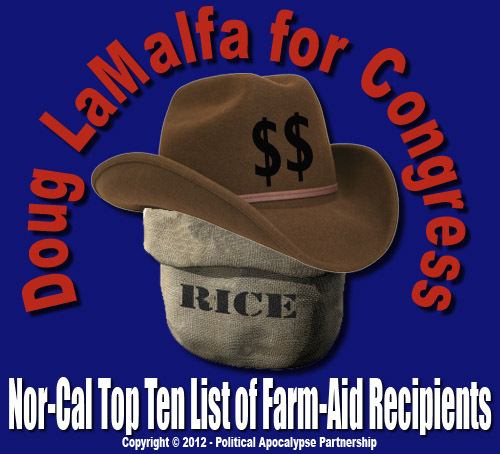 Visit Doug LaMalfa’s website – look at the Issues and Solutions Webpage. There’s nothing there! – It says coming soon. In contrast – look at Sam Aanestad’s Website. Look at Colonel Pete’s Website… There are issues there! It is stuff like this that makes it difficult to buy rice. I feel like I am being double-taxed every time I do. I am running for this office as well. My website is http://www.votedacquisto.com. I have my solutions to the problems posted. They have been from day 1. Check it out. Oh those Lincoln Clubs: Connect the Dots and Discover the Meaning of Cronyism Someone Explain This? LaMalfa / Logue Colluding?